As the end of summer nears, the cruise industry ‘big season’ is in full swing. With over 100 new ocean-going cruise ships expected to enter the market over the next ten years, and the ‘always-on’ life-style of travelers these days – the bandwidth demand (and revenue potential) for cruise connectivity is growing significantly. 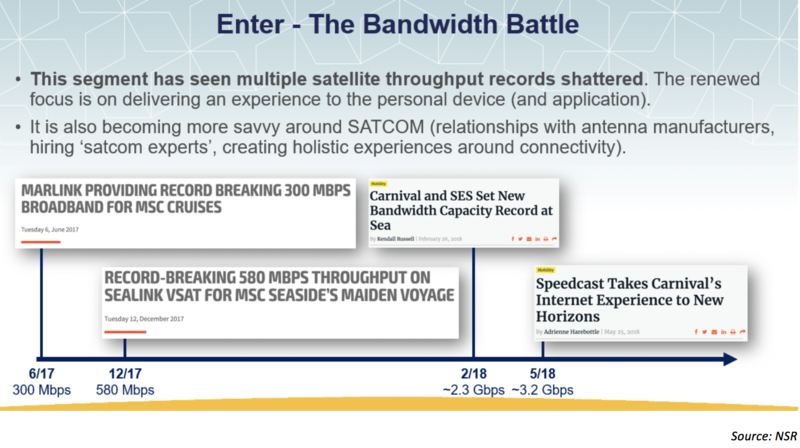 From 300 Mbps to MSC cruises announced by Marlink in June 2017 to the most recent 3.2 Gbps of throughput delivered to a Carnival Cruise Line Ship in May of 2018, there are few satellite sectors that are seeing such record levels of growth to a customer’s single location . With over 570 Gbps of throughput growth expected between 2017 – 2027 according to NSR’s Maritime SATCOM Report, what applications are driving this growth? Unlike the macro-level trends around the significant pressures OTT and non-linear video are putting on DTH and video markets, for the Passenger Maritime market, consumer video consumption is the ‘killer app’. While we can argue that satellite operators would probably continue generating revenues through their well-established video businesses, headwinds in one market are turning into opportunities elsewhere in the satellite sector. 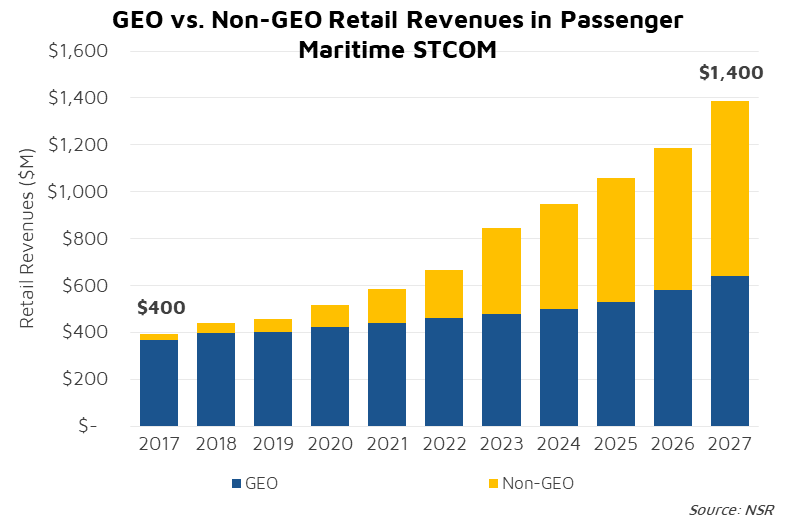 According to NSR’s Maritime SATCOM Market’s 6th Edition, commercial passenger markets will post double-digit revenue growth over the next ten years, adding almost $1 Billion in retail revenues for the satellite industry. On the footsteps of the recent bandwidth-battles earlier this year where individual ships posted record-setting throughput from both GEO and Non-GEO connectivity, the sector is at the forefront of high-end satcom deployments. Between GEO and Non-GEO HTS, we should continue to see significant innovation, throughput records, and ultimately revenue growth, coming out of the passenger maritime sector, in particular from cruise ship owners. Alongside delivering video and media content to passengers, the ‘always connected’ culture extends into the crew. At-sea for significant period of times, Internet access and connectivity has always been a key component of keeping connected to family and friends ashore. Another key component of that access has been cost. However, one cruise line has begun rolling out free connectivity for crew members on its ships. Limited to terrestrial connectivity while in-port, it is only a matter of time before the same experience can be brought to crew while at-sea. The real question remains on the passenger side. Just as in the aeronautical sector, the model for maritime passenger connectivity largely relies on pay to play. With the development of higher throughput satellites, Non-GEO playing a larger role in connectivity strategies, and the falling cost of capacity, are we approaching a time where connectivity services can be ‘free’? Only time will tell, but as industry awaits the next-round of contract announcements that will propel the passenger satellite connectivity sector into the 2020’s, the model for connecting passengers to internet connectivity will continue to evolve. At over $1.4 Billion in retail revenues by 2027, and 570 Gbps of capacity growth, NSR believes the commercial passenger connectivity space remains a key source of ‘new satcom growth’. Just as NSR explored in the business aviation market earlier this week, higher capacity systems that are bringing much lower prices into the market are accelerating growth. While the value-chain continues to struggle with the best models and methods to approach cruise lines, one thing is clear – the bandwidth battles are only beginning.